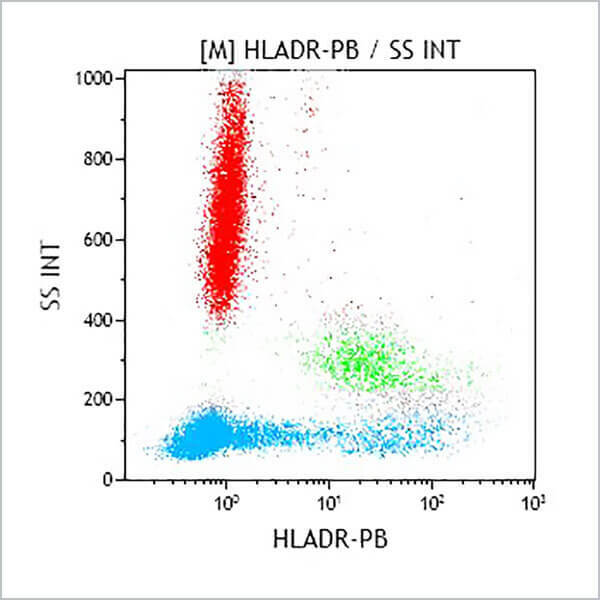 HLA-DR molecules are found on antigen-presenting cells (APC), i.e. dendritic cells, B lymphocytes, monocytes, macrophages, and thymic epithelial cells. They are also expressed on activated T cells, but not on granulocytes, platelets, or red blood cells. Resting T cells or endothelial cells that do not normally express these molecules can be induced to express them. *Alexa Fluor and Pacific Blue are registered trademarks of Molecular Probes, Inc.